Get peace of mind with this hassle-free, automatic payment option. Any residential or business customer from any state can sign up for Auto Pay. However, if you are on a Pay Arrangement, you cannot use Auto Pay. You must be enrolled in My Account and pay with your checking or savings account to use this payment option. 1. Enroll online for Auto Pay through My Account. First, register with My Account. Next, select My Programs, choose Program Opportunities and click on the Plus sign next to Billing and Payment. Choose Learn More under Auto Pay. Enrollment is immediate after successful submission and verification of information. 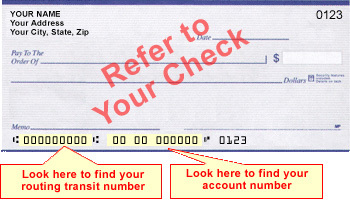 All you need is a recent bill and your banking information, checking account and bank routing numbers, found at the bottom of your checks. 2. Alternatively, you can enroll via mail. Print the mail-in application and follow the instructions on the form. Processing time takes about two to three weeks. If you have any questions, call our Customer Contact Center at 800-895-4999 or send them an e-mail. If you have multiple accounts with us but have the same debtor number, all accounts must be set up from the same bank account for Auto Pay. If your bank account shows insufficient funds, we'll assess a return check charge on your next bill. You’ll be removed from Auto Pay if you have two months of insufficient funds within a year.